First, attitudes towards the European Union are multidimensional. This means that whether you trust the European Parliament for example is not strongly related to some other opinion on European integration like whether you perceive the EU as a threat to national identity. A survey in the Netherlands (2008) reveals five separate dimensions of EU attitudes – negative affection, identity, performance, utilitarianism, and strengthening the EU . As a result, several different factors relate to anti-EU voting in EP elections – assessment of the democratic deficit, low perceived utility of the EU, negative affection, opposition to EU integration, and the absence of EU identity . This is an important finding because it shows that voting in EU elections is not related only to national concerns and satisfaction with the national government, and because it identifies several different aspects of EU attitudes that matter. Similarly, specific issue concerns rather than general dissatisfaction with the EU or national governments explain the No votes in the French and Dutch referenda on the ill-fated EU Constitution . Hence, voter attitudes towards the Constitution are multidimensional as well. Second, group identity considerations affect strongly hostility towards the EU . 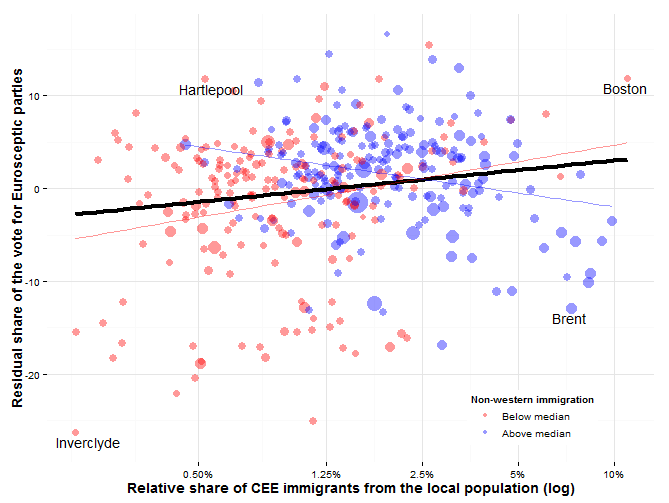 Attitudes towards immigrants are the most important predictors of Euroscepticism in Ireland and the Netherlands . While how religious you are is not systematically related to your assessment of the EU, religious intolerance and negative feelings towards Islam increase Euroscepticism (in the Netherlands, and to a lesser extent in Ireland) . Negative feelings towards immigrants (in NL) and religious intolerance (in Ireland) explain opposition to Turkey’s membership of the EU as well . The importance of identity and the fear of economic migration, however, differs across the members of the EU. In wealthy states economic xenophobia matters more than in poor states, and for the high net-contributors to the EU budget the negative effects of exclusive national identity are greater . So perhaps not surprisingly, EU contestation exists mostly in the realm of identity politics (during the last EP election campaign at least) . Election and referendum campaigns matter because they emphasize certain issues and aspects of EU integration over others, thus priming the voters . Right wing parties are the ones more likely to bring identity concerns during the election campaigns and countries with more Eurosceptic parties are more likely to put attention to EU issues . But when the campaign environment is intense, party messages matter less to the voters . In summary, from the many dimensions of EU attitudes that are important for how you assess and vote on EU issues, identity (and the related fear of immigrants) is one of the most important and the one that is the most likely to get politicized , mostly by right-wing and Eurosceptic parties. Adam, S. and M. Maier 2011. ‘National parties as politicizers of EU integration? Party campaign communication in the run-up to the 2009 European Parliament election’, European Union Politics, 12, 431-453. Boomgaarden, H.G., A.R.T. Schuck, M. Elenbaas and C.H. de Vreese 2011. ‘Mapping EU attitudes: Conceptual and empirical dimensions of Euroscepticism and EU support’, European Union Politics, 12, 241-266. Garry, J. and J. Tilley 2009. ‘The Macroeconomic Factors Conditioning the Impact of Identity on Attitudes towards the EU’, European Union Politics, 10, 361-379. Hobolt, S.B. and S. Brouard 2010. ‘Contesting the European Union? Why the Dutch and the French Rejected the European Constitution’, Political Research Quarterly. Hobolt, S.B., W. Van der Brug, C.H. De Vreese, H.G. Boomgaarden and M.C. Hinrichsen 2011. ‘Religious intolerance and Euroscepticism’, European Union Politics, 12, 359-379.
 van Spanje, J. and C. de Vreese 2011. ‘So what’s wrong with the EU? Motivations underlying the Eurosceptic vote in the 2009 European elections’, European Union Politics, 12, 405-429. Last week we had the pleasure to hear Professor Dani Rodrik deliver the annual lecture of the Dutch Scientific Council for Government Policy (WRR). The lecture was a brilliant example how a widely published academic economist, active in the best scientific journals in his field, can fulfill a public role and explain in an elegant, yet simple way, without a single graph or table, a complex argument. The full lecture is not available (summary here), but the theme and content were the same as the arguments developed in Rodrik’s latest book, The Globalization Paradox. Briefly, Rodrik argues that the move towards hyperglobalization in the last two decades, meaning the removal of all border controls to trade and financial capital, has led to a reduction of policy space for governments. Democracy has been affected, as in many cases constituencies have lost their access to points where policies were being made, leading to a situation where a trilemma exists between national sovereignty, democracy and (hyper)globalisation. The trilemma means that we cannot, as he argues in The Globalization Paradox (p xviii), simultaneously pursue democracy, national determination and economic globalization. If we were to push further with globalization, he clarifies, we have to give up either the nation-state or democratic politics. In his WRR lecture he argued that the European Union is a unique example where common institutions are being built to balance the removal of border controls at the national level. The EU, he argued, has been in the process of creating a counterbalance to hyperglobalization in the form of institutional rules. But, he added, the global financial crisis came too soon for this process of rule creation to make enough of a difference. Apparently, before the lecture Rodrik met the Dutch Prime Minister for lunch, which, one hopes, was an occasion to share his views on the implications of the globalisation paradox for Europe. His interpretation of the EU’s role in the crisis was an optimistic and friendly one. In his lecture he made sure to stress his view of these implications was not an Euroskeptic one. However, it is clear that if one takes his arguments seriously, the euro zone version of his trilemma means that EU has either to move towards political union – institutionalizing more common rules at EU level – or decrease the level of globalisation, that is, abandon Economic and Monetary Union. He left it there, although it is clear from this piece published by the Project Syndicate what he thinks of the break up of the eurozone.